A few weeks ago I ran into the fine folks from Skout Organics handing out samples of their bars and pumpkin seeds. I added the snacks to my "outdoor snacks" drawer for easy prep when going hiking, camping, or whatever. As I was loading the car for a day of surfing on the Oregon Coast, I figured it was a good a time to try the new Skout products, which I had never tasted before. As I sat warming in the sun at Short Sands, I opened the Black Pepper BBQ Pumpkin Seeds and immediately fell in love. I reluctantly offered some seeds to my friends and we polished off the bag in no time. I then tried a bar, and it was just as delicious as the seeds. As soon as I got back into the office, I emailed the kind woman who shared the samples raving about their products and asked about the company. For this month's community profile, here's a bit about Skout Organics, their products, and a discount code for all Outdoor Project readers. Skout was born in the Pacific Northwest, an area known for its connection to the land. It is also where founder, Jason Pastega, discovered his passion for everything outdoors. Jason’s love for high-quality and nutritious foods came from his family. His parents opened a gourmet foods store in 1979, and Jason and his siblings spent much of their youth in the store learning the benefits of simple, high quality food. Years later, while on the go at work and on the trail, Jason became a big consumer of many varieties of energy and nutrition bars. However, he was very disappointed with the options. Many claimed to be healthy, but they had artificial ingredients with complicated names and were filled with excess sugars. Because he grew up around his parent’s store, Jason knew that good food did not have to be complicated. So Jason did the only natural thing he could do and decided to try his hand at making his own bars. Using only the tools he could find in his kitchen, Jason mixed a few of his favorite organic ingredients and rolled them out right on the counter. Those would be the first Skout Organic Trail Bars. Now entering 2016, the Skout team is working hard to bring you more of the best organic food out there. These snacks are ready to fuel any adventure you might take them on! Skout’s mission is to provide great tasting, healthy, organic foods to sustain those who embrace adventure and actively pursue the outdoors. 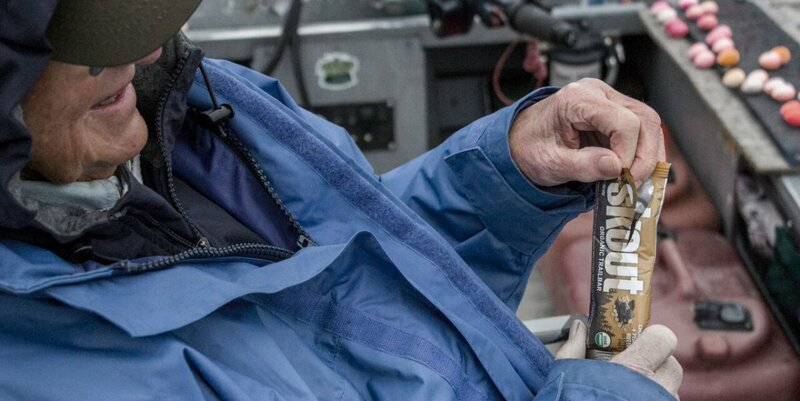 Made with delicious organic ingredients, Skout Organic Trail Bars embody the rugged and energetic spirit of the region. They are the perfect nutritional choice for outdoor activities because they are packed with vitamins and minerals. They contain only naturally occurring nutrients and no refined sugar or fillers. Delicious varieties include Chocolate Coconut, Chocolate Peanut Butter, Blueberry Almond, Apple Cinnamon, and Cherry Vanilla. Raw pumpkin seeds are truly a superfood! 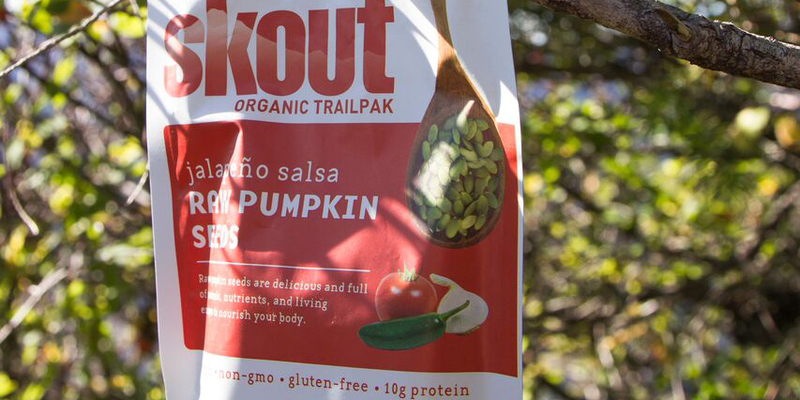 Savory and rich in nutrients, Skout Organic Seasoned Raw Pumpkin Seeds are a snack that you can feel great about eating. With mouthwatering flavors such as Black Pepper BBQ, Jalapeno Salsa, and Pacific Sea Salt, you'll be sure to find a favorite flavor to take along on your next hike or bike ride. Among the many benefits, they are high in protein, zinc, iron, and magnesium. By sourcing living seeds, we preserve their inherent nutrients and enzymes, providing your body with healthy fuel. All Skout products are certified organic, certified gluten free, non-GMO product verified, contain no refined sugars or fillers, certified kosher, vegan, dairy and soy free. Give Skout a try! Use the code OPSkout15 to get 15% off your order through the end of February.